Atherosclerosis is an inflammatory disorder orchestrated by cytokines, and IFN-γ, which is expressed at high levels in atherosclerosis lesions, is emerging as a master regulator of this disease (1). This cytokine regulates a number of steps during atherogenesis, including macrophage foam cell formation, recruitment of leukocytes to the activated endothelium, and plaque stability and remodeling. Deficiency of either this cytokine or its receptors limits the development of atherosclerosis in mouse models of this disease, whereas in vivo administration of IFN-γ potentiates it (1). Investigation of the signaling pathways underlying IFN-γ actions in atherosclerosis should benefit the identification of novel therapeutic targets for the treatment of this disease. The JAK–STAT pathway plays a key role in IFN-γ signaling (1). Indeed, knockout of STAT1 attenuates the development of atherosclerosis in mouse models of this disease (2). JAKs phosphorylate STAT1 at Tyr701, leading to the dimerization of the protein, its migration to the nucleus, and regulation of gene transcription through interaction with regulatory regions in target gene promoters (1). In addition to Tyr701, phosphorylation of Ser727 is required for maximal activity (1, 3). Several candidate kinases have been found to phosphorylate Ser727 (1, 3, 4), although the exact roles of these remain poorly understood, particularly in macrophages in relation to atherosclerosis. Our previous studies have provided novel insights into IFN-γ signaling and revealed critical roles for casein kinase 2 (CK2) and PI3K in the IFN-γ–regulated expression in mouse macrophages of several key genes implicated in atherosclerosis (4, 5). The action of both of these kinases was mediated, at least in part, through the regulation of STAT1 Ser727 phosphorylation (4). The precise roles of the other candidate kinases that are known to modulate STAT1 actions are poorly understood in human macrophages. The purpose of this study was to investigate the roles of these kinases in IFN-γ signaling in human macrophages in relation to STAT1 activation, the regulation of key genes implicated in atherosclerosis, and the uptake of modified lipoproteins. Our studies reveal a potentially crucial role for ERK in these processes. Cell lines (human monocytic THP-1 and human hepatoma Hep3B) were from the European Collection of Animal Cell Cultures (Salisbury, U.K). PD98059, SP600125, SB203580, KN93, and rottlerin were from Merck (Calbiochem, Nottingham, U.K.). Abs were from Santa Cruz Biotechnology (Santa Cruz, CA; STAT1 p89/94), Sigma-Aldrich (Poole, U.K.; β-actin), and Cell Signaling Technology (Hertfordshire, U.K.; STAT1 pSer727, STAT1 pTyr701). Recombinant IFN-γ was from PeproTech (London, U.K), SuperFect was from Qiagen (Crawley, U.K.), a nonradioactive ERK assay kit was from Cell Signaling Technology, 1,1′-dioctadecyl-3,3,3′,3′-tetramethylllindocarbocyane (DiI)–labeled acetylated and oxidized low-density lipoproteins (AcLDL and oxLDL, respectively) were from Intracel (Frederick, MD), and PMA was from Sigma-Aldrich. Human THP-1 and Hep3B cell lines were maintained in complete RPMI 1640 or DMEM medium, respectively, supplemented with 10% (v/v) heat-inactivated FCS (56°C, 30 min), 100 U/ml penicillin, and 100 μg/ml streptomycin. Human monocyte–derived macrophages (HMDMs) were isolated from buffy coats supplied by the Welsh Blood Service (Pontyclun, U.K.) using Ficoll-Hypaque purification. Briefly, blood from the buffy coat was layered over Lymphoprep (Nycomed, Oslo, Norway) in Accuspin tubes (Sigma-Aldrich) and centrifuged at 800 × g for 30 min. The resultant mononuclear cell interface was collected and washed six to eight times in PBS containing 0.4% (v/v) trisodium citrate to remove platelets. Monocytes were allowed to adhere to tissue culture plates in complete RPMI 1640 containing 5% (v/v) heat-inactivated FCS, 100 U/ml penicillin, and 100 μg/ml streptomycin for 7 d to enable macrophage differentiation and permit removal of nonadherent lymphocytes. All cell cultures were maintained at 37°C in a humidified atmosphere containing 5% (v/v) CO2 in air. Differentiation of THP-1 monocytes into macrophages was performed for 24 h using 0.16 μM PMA, unless otherwise stated. Treatment of macrophages with IFN-γ or the pharmacological inhibitors was as previously described (4, 5). Whole-cell extracts were prepared in buffers containing phosphatase and protease inhibitors and used for Western blot analysis as previously described (4–6). Nonradioactive ERK assay was carried out using a kit from Cell Signaling Technology according to the manufacturer’s instructions. Semiquantitative RT-PCR on total cellular RNA was carried out as before (4, 6, 7) (see Supplemental Table I for sequences of primers). The products were size-fractionated by agarose gel electrophoresis and analyzed using a Syngene gel documentation system (GRI, Braintree, U.K.). Real-time quantitative PCR (RT-qPCR) was performed using SYBR Green JumpStart Taq ReadyMix (Sigma-Aldrich) and the Opticon 2 RT-qPCR detection system (MJ Research, Cambridge, MA) (8) (see Supplemental Table I for sequences of primers). The mRNA levels were determined using the comparative CT method and normalized to GAPDH mRNA levels (8). All RT-qPCRs were performed in duplicate, and cDNAs, cloned into pGEM-T vector, were used as standards for quantitation and to verify specificity by DNA sequencing. Analysis of cell surface ICAM-1 (CD54) expression was performed using an FITC-conjugated mAb against CD54 (MCA1615FT; AbD Serotec, Oxford, U.K.) according to the manufacturer’s protocol and acquired on a FACSCanto (BD Biosciences, Oxford, U.K.) flow cytometer with at least 10,000 events acquired for each sample. The absence of the mAb was used as a negative control for cell surface ICAM-1 staining. Data were analyzed using FlowJo software (Tree Star, Ashland, OR) with ICAM-1 expression represented as a percentage of the vehicle control, which is indicated as 100%. Supernatants from cultured THP-1 macrophages were analyzed and quantified for levels of secreted human MCP-1, IFN-γ–inducible 10-kDa protein (IP-10), and MIP-1β protein using ELISA specific for human MCP-1, IP-10 (both BD Pharmingen [Oxford, U.K.] OptEIA ELISA kits) and MIP-1β (R&D Systems, Abingdon, U.K.) according to the manufacturers’ instructions. Transfection of Hep3B cells was performed using SuperFect (Qiagen) (7). The luciferase activity in cell extracts was determined using a commercially available kit (Promega, Southampton, U.K.) and normalized to the total protein concentration, which was measured using the Micro BCA protein assay reagent kit (Pierce, Cramlington, U.K.). The plasmid constructs were: 3xly6e from Prof. J. E. Darnell (Rockefeller University, New York, NY); MCPLuc from Prof. R. M. Ransohoff (Cleveland Clinic Foundation, Cleveland, OH); dominant negative (DN) ERK-1 and ERK-2 from Prof. M. H. Cobb (University of Texas Southwestern Medical Center, Dallas, TX); DN JNK from Prof. E. Nishida (Kyoto University, Kyoto, Japan); DN MEK-1 from Prof. J. Han (The Scripps Research Institute, La Jolla, CA); and DN Raf and DN Ras from Prof. I Komuro (Kyoto University). An adenovirus type 5 (Ad5) vector was engineered to express ERK-1 or ERK-2 shRNA flanked by sequences from the murine BIC gene (134–161 and 221–265) to enable the shRNA to be processed by the endogenous microRNA cellular machinery (RAd-ERK-1 or –ERK-2 shRNA) (8, 9). An appropriate ERK1 shRNA (targeting the 5′-GGAAGCCATGAGAGATGTCTA-3′ sequence) and an appropriate ERK2 shRNA (targeting 5′-CACAAGAAGACCTGAATTCTA-3′) were inserted into the Ad5 vector using the recombineering technology (10). Two oligonucleotides (see Supplemental Table II for sequences) that overlap by 25 bp at their 3′ and 5′ ends, respectively, were designed to contain the appropriate ERK-1 or ERK-2 shRNA sequence and arms of homology to facilitate homologous recombination into the Ad5 vector. Each oligonucleotide (100 ng) was transformed into induced Escherichia coli SW102 that contained the Ad5 vector genome in a modified bacterial artificial chromosome, and appropriate recombinants were identified as previously described (10). Adenovirus was then amplified, purified, and titered (10). A recombinant adenovirus expressing a scrambled shRNA sequence (RAd-scrambled shRNA) was also generated for use as a control. THP-1 cells and 7-d-differentiated HMDMs were infected with either RAd-scrambled shRNA, RAd-ERK-1, or RAd-ERK-2 shRNA at a multiplicity of infection of 100 in 250 μl RPMI 1640 for 2.5 h at 37°C (rocking) prior to addition of 1.5 ml RPMI 1640 (including 0.16 μM PMA for THP-1 only to induce differentiation into macrophages) and incubation for a further 72 h. A multiplicity of infection of 100 was sufficient to infect > 98% THP-1 cells and >90% HMDMs as measured by flow cytometry following infection with a GFP-expressing recombinant adenovirus (data not shown). Cells were incubated for 24 h with 10 μg/ml DiI-AcLDL or DiI-oxLDL in RPMI 1640 containing 10% (v/v) delipidated FCS at 37°C in the absence or the presence of IFN-γ. Uptake was analyzed by flow cytometry on a FACSCanto (BD Biosciences) flow cytometer with at least 10,000 events acquired for each sample. The uptake is represented as a percentage with the untreated control indicated as 100%. The signals from Western blots or RT-PCR were subjected to densitometric analysis using the GeneTools software (GRI). Statistical comparisons between all data were carried out using the Student t test with p < 0.05 considered as statistically significant. The human THP-1 cell line has been employed extensively to investigate cytokine-mediated regulation of macrophage gene expression relevant to atherogenesis due to its paralleled conservation of mechanisms with primary HMDMs (4, 7, 8). This cellular system was therefore used initially to delineate the impact of different signaling pathways on the activation of STAT1 in macrophages. Time-course Western blot analysis showed that IFN-γ produced a statistically significant increase in the levels of STAT1 phosphorylated at either Tyr701 or Ser727 without affecting the total levels of this protein (Supplemental Fig. 1). Marked IFN-γ–induced phosphorylation at both sites was observed at 30 min with the levels of phospho-STAT1 Ser727 maintained at similar levels throughout the 180-min incubation period, whereas those for phospho-STAT1 Tyr70 decreased. The 30-min time point, which corresponded to almost maximal phosphorylation at both sites, was selected for further studies. Previous studies have shown several kinases to affect serine phosphorylation of the different STATs, including CK2, PI3K, ERK, JNK, p38 kinase, protein kinase C (PKC)δ and calcium calmodulin–dependent kinase (CamK) II (11). However, the roles of these kinases on the IFN-γ–mediated activation of STAT1 in human macrophages is poorly understood. Our previous research showed that the IFN-γ–induced levels of phospho-STAT1 Ser727, but not phospho-STAT1 Tyr701, were attenuated following inhibition of CK2 and PI3K in the mouse macrophage J774.2 cell line (4). A statistically significant reduction of phospho-STAT1 Ser727 levels by the CK2 inhibitor apigenin and the PI3K inhibitor LY294002 were also observed in THP-1 macrophages (data not shown). We next investigated the impact of different concentrations of inhibitors of ERK, JNK, p38 kinase, PKCδ, and CamK II on IFN-γ–mediated phosphorylation of STAT1. The concentration of these inhibitors was based on an extensive literature survey of their actions in macrophages. The ERK inhibitor PD98059, which targets both ERK-1 and ERK-2, and the JNK inhibitor SP600125 produced a statistically significant attenuation of the IFN-γ–induced STAT1 phosphorylation at Ser727, but not Tyr701 (Fig. 1). In contrast, the p38 kinase inhibitor SB2023580 had no effect, whereas the PKCδ and CamK II inhibitors (rottlerin and KN93, respectively) affected the IFN-γ–induced phosphorylation at both of these sites (Fig. 1). The action of the different inhibitors on the IFN-γ–induced STAT1 phosphorylation. THP-1 macrophages were pretreated for 1 h with the DMSO vehicle (amount corresponding to the highest concentration of each inhibitor) or the indicated inhibitor (5, 10, or 50 μM PD98059; 5, 15, and 30 μM SP600125; 5, 10, and 30 μM SB2023580; 3, 6, and 10 μM rottlerin; 5, 10, or 20 μM KN93). The cells were incubated for 30 min in the absence or the presence of IFN-γ (1000 U/ml). Western blot analysis was performed using Abs against pSTAT1 Tyr701, pSTAT1 Ser727, and total STAT1 (STAT1p84/91). The data from three independent experiments were subjected to densitometric and statistical analysis, and the graphs show the relative phosphorylation level (mean ± SD) of STAT1 at Tyr701 or Ser727 normalized to the expression of the total STAT1 protein. The value from cells incubated in the presence of IFN-γ and the DMSO vehicle has been arbitrarily assigned as 1 (not shown) with the others represented to this value. *p < 0.05; **p < 0.01; ***p < 0.001. Comparison of the relative suppression of IFN-γ–induced STAT1 Ser727 phosphorylation by all the pharmacological inhibitors showed the most pronounced attenuation by the ERK inhibitor PD98059. Further studies therefore focused on this pathway. Similar to PD98059, another ERK inhibitor, U0126, also attenuated the IFN-γ–induced phosphorylation of STAT1 on Ser727 but not Tyr701 (Supplemental Fig. 2). Because STAT1 Ser727 phosphorylation is required for maximal activation, inhibition of ERK1/2 should attenuate the IFN-γ–induced expression of known target genes of the JAK–STAT pathway. This hypothesis was investigated initially using the inhibitor PD98059 and semiquantitative RT-PCR analyses of several key genes implicated in inflammation and/or atherosclerosis: MCP-1, MIP-1β, IP-10, ICAM-1, suppressor of cytokine signaling (SOCS)-1, and inducible cAMP early repressor (ICER). With the exception of ICER, the IFN-γ–inducible expression of these genes is thought to occur via the JAK–STAT pathway (1, 4, 12). 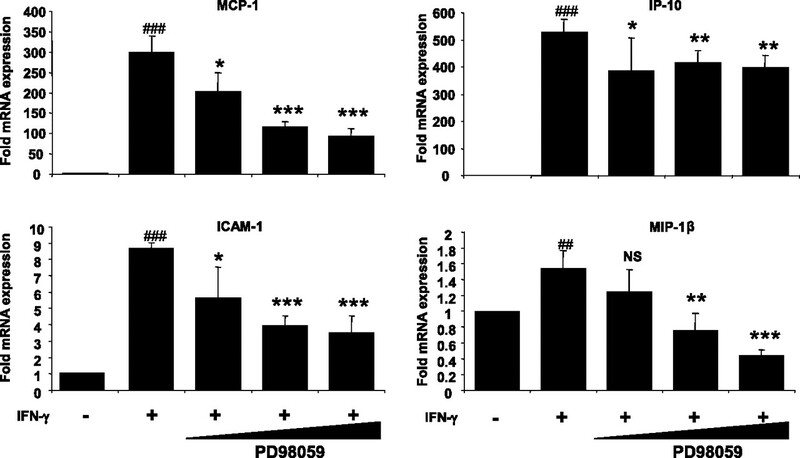 The IFN-γ–induced expression of MCP-1, ICAM-1, SOCS-1, MIP-1β, and IP-10, but not ICER, was attenuated by PD98059 (Supplemental Fig. 3), thereby indicating that ERK1/2 was integral for changes in the expression of key atherosclerosis-associated genes by this cytokine. To confirm these findings on the critical role for ERK based on semiquantitative RT-PCR further, RT-qPCR was carried out on representative genes. As shown in Fig. 2, the IFN-γ–induced expression of MCP-1, ICAM-1, MIP-1β, and IP-10 was inhibited by PD98059. The IFN-γ–induced mRNA expression of several key genes implicated in atherosclerosis is attenuated by the ERK inhibitor PD98059. RT-qPCR for MCP-1, ICAM-1, IP-10, and MIP-1β was performed on cDNA from THP-1 macrophages that were pretreated for 1 h with DMSO vehicle (–, amount corresponding to the highest concentration of inhibitor) or PD98059 (5, 30, or 50μM) and then incubated for 3 h in the absence or the presence of IFN-γ (1000 U/ml). MCP-1, ICAM-1, IP-10, and MIP-1β mRNA levels were calculated using the comparative CT method and normalized to GAPDH levels with the DMSO control given an arbitrary value of 1 with the others represented to this value (mean ± SD; n = 4). Statistical anlaysis was performed using a Student t test with IFN-γ–treated cells compared with the DMSO control (##p < 0.01; ###p < 0.001) and PD98059-treated, IFN-γ–stimulated cells compared with DMSO-treated, IFN-γ–stimulated cells (*p < 0.05; **p < 0.01; ***p < 0.001). To confirm that the inhibition of IFN-γ–induced mRNA expression of genes shown in Fig. 2 also occurred at the level of protein, the cell surface expression of ICAM-1 was determined by FACS analysis and that of secreted MCP-1, IP-10, and MIP-1β were determined by ELISA. As shown in Fig. 3, the IFN-γ–induced expression of cell surface ICAM-1 and secreted MCP-1, IP-10, and MIP-1β was indeed inhibited by PD98059. The IFN-γ–induced expression of ICAM-1, MCP-1, IP-10, and MIP-1β proteins is ERK1/2-dependent. ICAM-1 cell surface expression (A) and secretion of MCP-1, IP-10, and MIP-1β (C) was measured on THP-1 macrophages that were pretreated for 1 h with DMSO vehicle (–, amount corresponding to the highest concentration of inhibitor) or PD98059 (5, 30, or 50 μM) and then incubated for 3 h in the absence or the presence of IFN-γ (1000 U/ml). A representative flow cytometric analysis of ICAM-1 cell surface expression is shown in B. The shading indicates Ab control; dashed line indicates DMSO-treated cells; solid line indicates DMS0-treated, IFN-γ–stimulated cells; and dotted line indicates IFN-γ–treated cells in presence of 50 μM PD98059. The data in A and C are representative of four separate experiments and represent mean ± SD (the value for ICAM-1 in cells treated with the DMSO vehicle alone in A has been arbitrarily assigned as 1 with the others represented to this value. Statistical analysis was performed using a Student t test with IFN-γ–treated cells compared with the DMSO control (#p < 0.05; ###p < 0.001) and PD98059-treated, IFN-γ–stimulated cells compared with DMSO-treated, IFN-γ–stimulated cells (*p < 0.05; **p < 0.01; ***p < 0.001). To further confirm the role of the ERK pathway in IFN-γ signaling, the effect of expression of DN forms of key components of this signaling cascade on the IFN-γ–mediated activation of an artificial promoter, containing three copies of the Ly6E STAT binding site upstream of a luciferase reporter gene (4), was next investigated. This artificial promoter has been used in numerous studies to monitor trans-activation by IFN-γ and STAT1 (4). Because of difficulties in transfecting macrophages at high efficiency with exogenous DNA, the experiments were performed in the human hepatoma Hep3B cell line (4), where the IFN-γ–mediated STAT1 Ser727 phosphorylation was also attenuated by ERK1/2 inhibition (data not shown). The DN plasmids used corresponded to ERK1, ERK2, Ras, and Raf, with DN JNK also included for comparative purposes because of inhibition of STAT1 Ser727 phosphorylation by SP600125 (Fig. 1). The DN ERK-1 and ERK-2 plasmids specify for kinase-inactive mutants of the enzymes due to lysine to arganine substitutions at residues 71 and 52, respectively (13, 14). In DN JNK, the phosphorylation site Thr-Pro-Tyr had been changed to Val-Pro-Ala (15), whereas in DN MEK1, the Ser218 in the phosphorylation site has been changed to alanine (16). DN Ras (Asn-17) and Raf (Ala-375) were included, as they often act upstream of ERK in the signaling pathway (17). Fig. 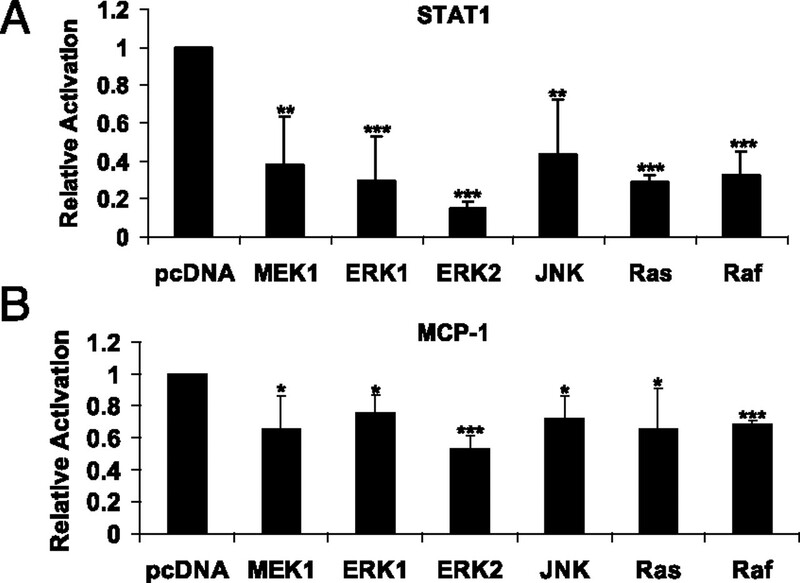 4A shows that transfection of DN MEK1, ERK1, ERK2, JNK, Ras, and Raf attenuated the IFN-γ–induced STAT1 activity. To rule out the possibility that the observed effects were due to the artificial nature of the promoter, the experiment was repeated using an MCP-1–luciferase promoter construct. This consists of the proximal 213-bp promoter region, containing STAT1-responsive IFN-γ response elements, linked to a luciferase gene (4, 18). The IFN-γ– induced activity of this promoter was also attenuated in a statistically significant manner by transfection of all DN mutants (Fig. 4B). The IFN-γ–induced activity of STAT1 and MCP-1 promoter is attenuated by expression of DN forms of ERK and various components of the pathway. Hep3B cells were transfected with the 3xly6e (three STAT1-responsive elements) or the MCP(213)Luc plasmids (panels A and B, respectively) along with the control pcDNA3 plasmid (pcDNA) or those specifying for DN forms of MEK1, ERK1, ERK2, JNK, Ras, and Raf. Transfected cells were incubated for 6 h in the absence or the presence of 100 U/ml IFN-γ and the luciferase activity in cell extracts was normalized to protein concentration. The fold activation by IFN-γ was determined with those from cells transfected with the control pcDNA3 plasmid arbitrarily assigned as 1 with the others represented to this value (mean ± SD). The data are from three independent experiments. *p < 0.05; **p < 0.01; ***p < 0.001. We next investigated whether IFN-γ induced ERK activity in macrophages using a nonradioactive kinase kit. In this assay, immobilized phospho-ERK Ab is used to immunoprecipitate the enzyme from cell extracts, and an in vitro kinase assay is then performed using its downstream target, the Elk-1 protein, as a substrate with phosphorylation monitored using phospho-Elk-1 (Ser383) Ab. Fig. 5A shows that IFN-γ induces ERK activity in macrophages as measured by increased Elk-1 phosphorylation. The action of various inhibitors on this IFN-γ–induced ERK activity was next determined. 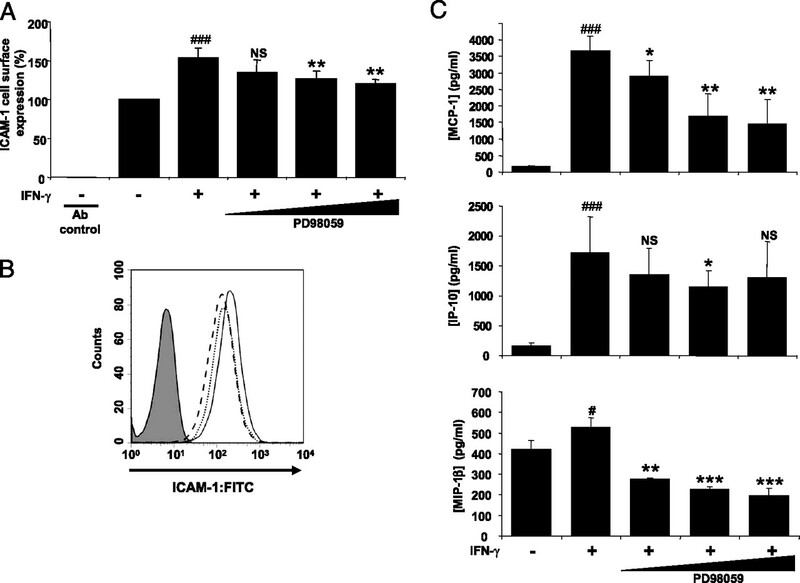 The IFN-γ–induced ERK activity was only inhibited by PD98059 (Fig. 5B). The positive actions of all the inhibitors were confirmed by monitoring attenuation of IFN-γ–induced STAT1 Ser727 phosphorylation (Fig. 5B). 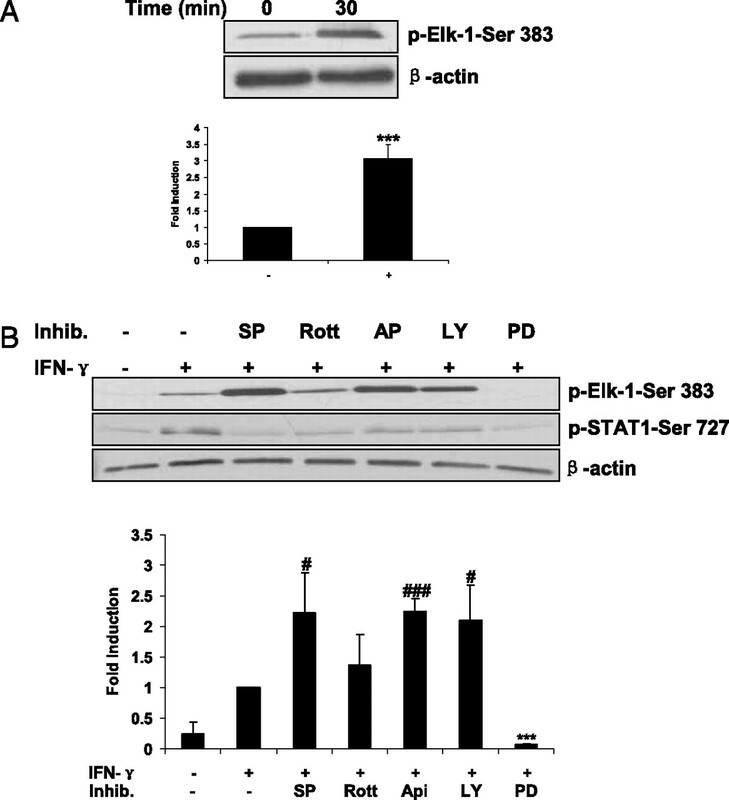 Interestingly, the IFN-γ–induced ERK activity was enhanced by SP600125, apigenin, and LY294002, but it was unaffected by rottlerin (Fig. 5B). The exact reasons for this are currently unclear, but it is possible that inhibiting one pathway could lead to increased activity of others induced by this cytokine as a compensatory mechanism to maintain full cellular responses. IFN-γ activates ERK in macrophages. THP-1 macrophages were treated for 0 h or 30 min with IFN-γ (1000 U/ml) (A) or pretreated for 1 h with the DMSO vehicle or SP600125 (30 μM), rottlerin (10 μM), apigenin (20 μM), LY294002 (30 μM), or PD98059 (50 μM) and then incubated for 30 min in the absence or the presence of this cytokine (B). Whole-cell extracts were then subjected to in vitro kinase assays where the ability of immunoprecipited ERK to phosphorylate the Elk substrate was analyzed by Western blot analysis. Similar Western blots on whole-cell extracts were also performed using Abs against β-actin to verify equal amounts of proteins, and p-STAT-Ser727 to monitor phosphorylation at this residue. The graphs show the fold induction in the relative phosphorylation of Elk normalized to β-actin (mean ± SD), as determined by densitometric analysis, from three independent experiments. The value from cells incubated in the absence of IFN-γ (A) or presence of IFN-γ with vehicle alone (B) has been arbitrarily assigned as 1 with the others represented to this value. Asterisks indicate significant induction of ERK activity compared with untreated cells (A) or inhibition of IFN-γ–induced activity by PD98059. ***p < 0.001. A pound sign indicates increase in IFN-γ–induced ERK activity by the inhibitor. #p < 0.05; ###p < 0.001. AP, apigenin; LY, LY294002; PD, PD98059; Rott, rottlerin; SP, SP60012. IFN-γ promotes macrophage foam cell formation in vitro and in vivo (1). Our previous studies have shown that IFN-γ induces the uptake of AcLDL and oxLDL by human macrophages (Ref. 8 and data not shown). We therefore determined the effect of the ERK1/2 inhibitor PD98059 on the IFN-γ–induced uptake of AcLDL by THP-1 macrophages. THP-1 macrophages are used extensively to study macrophage foam cell formation, including the action of IFN-γ, and express all the major proteins involved in this process, including scavenger receptors (8, 19–21). Initial experiments showed that maximal AcLDL uptake occurred at 24 h, which was therefore used for all subsequent experiments. SP600125 was included, either alone or in combination with PD98059, for comparision because JNK has been implicated in the uptake of modified LDL, foam cell formation, and atherosclerosis (22). Inhibition of ERK1/2 attenuated the increase in AcLDL uptake observed in IFN-γ–stimulated macrophages (Supplemental Fig. 5). Additionally, ERK1/2 inhibition reduced levels of basal AcLDL uptake, suggesting it has a role in AcLDL uptake by itself. Similarly, JNK inhibition attenuated the IFN-γ response on AcLDL uptake and reduced basal levels of AcLDL uptake by macrophages. Interestingly, coculture of both inhibitors produced a greater effect on AcLDL uptake in untreated and IFN-γ–stimulated macrophages. To further confirm the results obtained using the ERK1/2 inhibitor PD98059 on modified LDL uptake, ERK-1 and ERK-2 expression was knocked down using adenovirally delivered corresponding shRNA. Macrophages infected with a scrambled shRNA adenovirus were used as a control, and DiI-oxLDL was employed instead of DiI-AcLDL to rule out the possibility that the results are specific to the modified LDL used and since oxLDL contributes to atherosclerosis in vivo (1). Additionally, experiments were performed in both THP-1 macrophages and primary cultures of HMDMs to rule out the possibility that the results obtained in this study are peculair to the THP-1 cell line. Similar to THP-1 macrophages, HMDMs have been used extensively to study foam cell formation (8, 19, 23, 24). The specificity of knockdown was confirmed by RT-qPCR, which indicated >50% inhibition in the expression of the corresponding RNA (Fig. 6A, 6B). Thus, ERK1 mRNA expression was knocked down only in cells delivered with ERK1 shRNA but not ERK2 shRNA (Fig. 5). Similarly, ERK2 mRNA expression was knocked down only in cells delivered with ERK2 shRNA but not ERK1 shRNA (Fig. 6A, 6B). These studies demonstrate the specificity of knockdown. Consistent with the experiments using inhibitors, both basal and IFN-γ–induced uptake of oxLDL in THP-1 macrophages and HMDMs was attenuated following knockdown of ERK-1, ERK-2, or both (Fig. 6C, 6D). 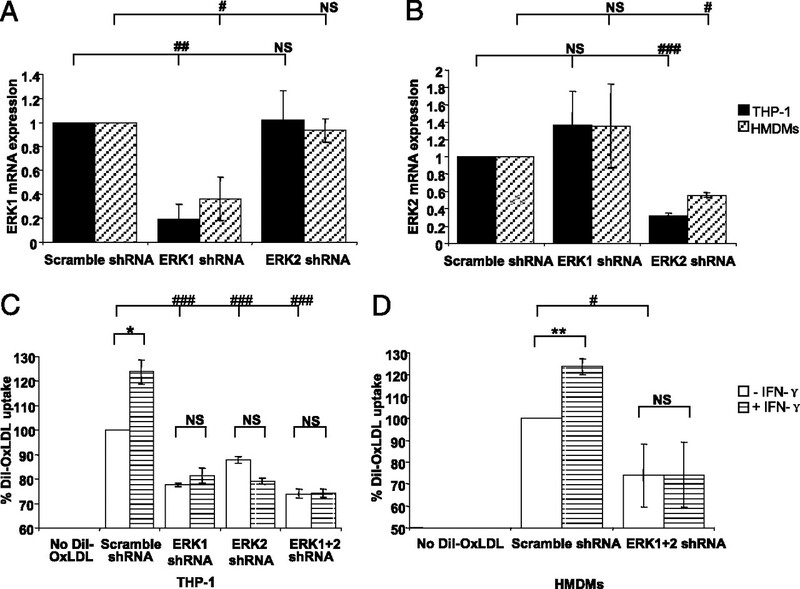 Thus, a significant IFN-γ–induced uptake of oxLDL was observed in cells delivered with scrambled shRNA but not ERK1 shRNA or ERK2 shRNA or both shRNAs (Fig. 6C, 6D). Additionally, knockdown of ERK1 or ERK2 or both resulted in a decrease in constitutive oxLDL uptake seen in cells incubated in the absence of IFN-γ. ERK-1 and ERK-2 are important for DiI-oxLDL uptake by IFN-γ–treated human macrophages. A and B, RT-qPCR for ERK1 (A) and ERK2 (B) was performed on cDNA from THP-1 macrophages or HMDMs infected with RAd-scramble shRNA, RAd-ERK1 shRNA, or RAd-ERK2 shRNA. ERK1 and ERK2 mRNA levels were calculated using the comparative CT method and normalized to GAPDH levels with RAd-scramble shRNA-infected cells given an arbitrary value of 1. C and D, THP-1 macrophages (C) or HMDMs (D) infected with RAd-scramble shRNA, RAd-ERK1 shRNA, or RAd-ERK2 shRNA or both shRNAs as indicated were incubated with 10 μg/ml DiI-OxLDL for 24 h in the absence or presence of IFN-γ (1000 U/ml) . DiI-oxLDL uptake was measured by flow cytometry. All data were derived from three separate experiments and represent mean ± SD. Significance of: induction by IFN-γ (*p < 0.05; **p < 0.01); inhibition in constitutive levels (#p < 0.05; ##p < 0.01; ###p < 0.001). We demonstrate a crucial role for ERK in the IFN-γ–induced STAT1 activation, associated changes in macrophage gene expression relevant to atherosclerosis, and the uptake of modified lipoproteins. Although previous studies have revealed a number of candidate kinases in the regulation of serine phosphorylation of STATs (11), the roles of these in macrophages in relation to atherosclerosis are poorly understood due to limited studies. Pharmacological inhibition revealed a role for ERK, JNK, PKCδ, and CamK II through the regulation of phosphorylation of STAT1 on Ser727 (ERK and JNK) or both Ser727 and Tyr701 (PKCδ and CamK II) (Fig. 1). In contrast, inhibition of p38 kinase had no effect (Fig. 1). These studies highlight cell-specific differences in serine phosphorylation of STATs that have been suggested by previous studies (11). The most extensive inhibition of STAT1 Ser727 phosphorylation was observed by ERK inhibitors (Fig. 1 and Supplemental Fig. 2), and these findings were extended by analysis of ERK activity, expression of IFN-γ inducible genes, and the action of DN mutants in transfected cells (Figs. 2–5). Gene expression analysis showed an important role for ERK in the IFN-γ–induced expression of several genes, including chemokines (MCP-1, MIP-1β, and IP-10), adhesion molecules (ICAM-1), and the gene responsible for negative regulation of cytokine responses (SOCS-1) (Figs. 2, 3, and Supplemental Fig. 3), all of which have been implicated in atherosclerosis (1). The expression of most of these genes is known to be regulated by IFN-γ through STAT1 (4, 12). This strongly suggests that ERK is responsible for the regulation of these STAT1 targets through modulation of Ser727 phosphorylation. Using primary murine bone marrow–derived macrophages (BMDMs), Valledor et al. (25) observed strong early activation of p38 kinase following IFN-γ treatment whereas weaker activation of ERK1/2 and JNK1 was detected with more delayed kinetics. In contrast to these studies, we observed a marked early activation of ERK within 30min of IFN-γ treatment (Fig. 5). It should be noted that the study of Valledor et al. (25) only monitored ERK phosphorylation whereas we have analyzed total kinase activity, which potentially takes all the activation steps into account. Another difference between these two studies is that in contrast to findings in other cell types (11), the IFN-γ-induced STAT1 Ser727 phosphorylation in bone marrow–derived macrophages was not affected by inhibition of any MAP kinases (25). The precise reasons for these differences are currently unclear, although species-specific variations might have contributed. Indeed, numerous differences in two aspects of atherosclerosis exist between humans and mice, inflammatory response and lipoprotein metabolism, thereby making it important that studies are carried out on human cells. The studies herein are therefore directly relevant to atherosclerosis in humans. Also note that the study of Valledor et al. (25) was restricted to expression of genes implicated in the innate immune response (e.g., chemokines [CCL5, CXCL9, and CXCL10], cytokines [TNF-α], and inducible NO synthase) and Ag presentation (CIITA and MHC class II molecules), whereas this study not only monitors gene expression but a cellular response critical to the pathogenesis of atherosclerosis (Fig. 6). The role of JNK in the control of foam cell formation and atherosclerosis is well understood (22). For example, JNK2−/−ApoE−/−, but not JNK1−/−ApoE−/−, mice were found to be resistent to diet-induced atherosclerosis, and SP600125 attenuated atherosclerosis in ApoE knockout mice (22). JNK2 has been found to phosphorylate scavenger receptor A in macrophages, and this has been implicated in the promotion of foam cells through facilitization of internalization of scavenger receptor A bound to modified LDL (22). We confirm the role of JNK in basal modified LDL uptake and also identify an important role in the IFN-γ response (Supplemental Fig. 4). The role of ERK in the uptake of cholesterol is poorly understood and, consistent with the actions on STAT1 activation and gene expression, we demonstrate a crucial role in modified LDL uptake (Fig. 6). Interestingly, while this manuscript was in preparation, Zhou et al. (26) showed that ERK1/2 also plays a role in the efflux of cholesterol from foam cells. They found significant increase in macrophage ABCA1 expression and cholesterol efflux to ApoAI and HDL acceptors following inhibition of ERK1/2 and, conversely, reduced cholesterol efflux and ABCA1 expression following activation of this kinase. Thus, ERK1/2 plays important roles in two critical steps in the control of macrophage cholesterol homeostasis: uptake of modified lipoproteins (as shown here) and the efflux of cholesterol from foam cells (26). In conclusion, IFN-γ is a master regulator of atherosclerosis and promotes uptake of modified LDL. We show a crucial role for ERK signaling in IFN-γ actions in human macrophages through the regulation of STAT1 activation and the uptake of modified lipoproteins. This work was supported in part by Grant PG/07/031/22716 from the British Heart Foundation.
. 2009. Interferon γ: a master regulator of atherosclerosis. Cytokine Growth Factor Rev. 20: 125–135.
. 2007. Signal transducer and activator of transcription 1 is required for optimal foam cell formation and atherosclerotic lesion development. Circulation 115: 2939–2947.
. 2003. Phosphorylation of the Stat1 transactivation domain is required for full-fledged IFN-γ-dependent innate immunity. Immunity 19: 793–802.
. 2007. Critical role for casein kinase 2 and phosphoinositide-3-kinase in the interferon-γ-induced expression of monocyte chemoattractant protein-1 and other key genes implicated in atherosclerosis. Arterioscler. Thromb. Vasc. Biol. 27: 806–812.
. 2008. The interferon-γ-mediated inhibition of lipoprotein lipase gene transcription in macrophages involves casein kinase 2- and phosphoinositide-3-kinase-mediated regulation of transcription factors Sp1 and Sp3. Cell. Signal. 20: 2296–2301.
. 2010. Requirement for nuclear factor κB signalling in the interleukin-1-induced expression of the CCAAT/enhancer binding protein-δ gene in hepatocytes. Int. J. Biochem. Cell Biol. 42: 113–119.
. 2005. A critical role for the Sp1-binding sites in the transforming growth factor-β-mediated inhibition of lipoprotein lipase gene expression in macrophages. Nucleic Acids Res. 33: 1423–1434.
. 2010. The TNF-like protein 1A-death receptor 3 pathway promotes macrophage foam cell formation in vitro. J. Immunol. 184: 5827–5834.
. 2006. Polycistronic RNA polymerase II expression vectors for RNA interference based on BIC/miR-155. Nucleic Acids Res. 34: e53.
. 2002. Stat1-dependent and -independent pathways in IFN-γ-dependent signaling. Trends Immunol. 23: 96–101.
. 2003. Regulation of insulin gene transcription by ERK1 and ERK2 in pancreatic β cells. J. Biol. Chem. 278: 32969–32977.
. 2008. Mitogen-activated protein kinase ERK1/2 regulates the class II transactivator. J. Biol. Chem. 283: 9031–9039.
. 1999. Activation of stress-activated protein kinase/c-Jun NH2-terminal kinase and p38 kinase in calphostin C-induced apoptosis requires caspase-3-like proteases but is dispensable for cell death. J. Biol. Chem. 274: 5310–5317.
. 1994. Identification of 2 serine residues of MEK-1 that are differentially phosphorylated during activation by raf and MEK kinase. J. Biol. Chem. 269: 19067–19073.
. 1996. Protein kinase C, but not tyrosine kinases or Ras, plays a critical role in angiotensin II-induced activation of Raf-1 kinase and extracellular signal-regulated protein kinases in cardiac myocytes. J. Biol. Chem. 271: 33592–33597.
. 1998. IFN-γ induction of the human monocyte chemoattractant protein (hMCP)-1 gene in astrocytoma cells: functional interaction between an IFN-γ-activated site and a GC-rich element. J. Immunol. 160: 3908–3916.
. 2010. IL-33 reduces macrophage foam cell formation. J. Immunol. 185: 1222–1229.
. 2004. Interferon-γ impedes reverse cholesterol transport and promotes foam cell transformation in THP-1 human monocytes/macrophages. Med. Sci. Monit. 10: BR420–BR425.
. 2004. CXCL16/SR-PSOX is an interferon-γ-regulated chemokine and scavenger receptor expressed in atherosclerotic lesions. Arterioscler. Thromb. Vasc. Biol. 24: 750–755.
. 2004. Requirement of JNK2 for scavenger receptor A-mediated foam cell formation in atherogenesis. Science 306: 1558–1561.
. 2009. Leptin modulates ACAT1 expression and cholesterol efflux from human macrophages. Am. J. Physiol. Endocrinol. Metab. 297: E474–E482.
. 2007. Human immunodeficiency virus protease inhibitor ritonavir inhibits cholesterol efflux from human macrophage-derived foam cells. Am. J. Pathol. 171: 304–314.
. 2008. Selective roles of MAPKs during the macrophage response to IFN-γ. J. Immunol. 180: 4523–4529.
. 2010. Inhibition of ERK1/2 and activation of liver X receptor synergistically induce macrophage ABCA1 expression and cholesterol efflux. J. Biol. Chem. 285: 6316–6326.